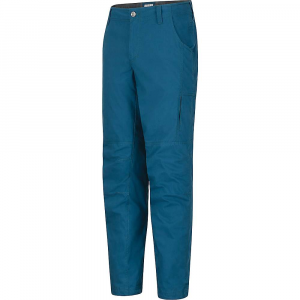 The Gamma SL Rock pant is the perfect pant for any rock adventures. 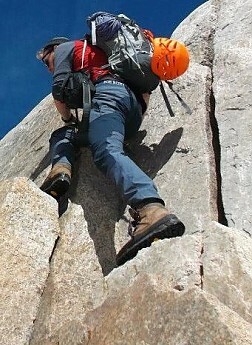 Climbing it allows fluid movement, and doesn't compromise on bagginess. little features make it usable, and essential. But above all the comfort is exceptional. In the alpine, scrambling, and at the crag outside of the summer it is the perfect choice. 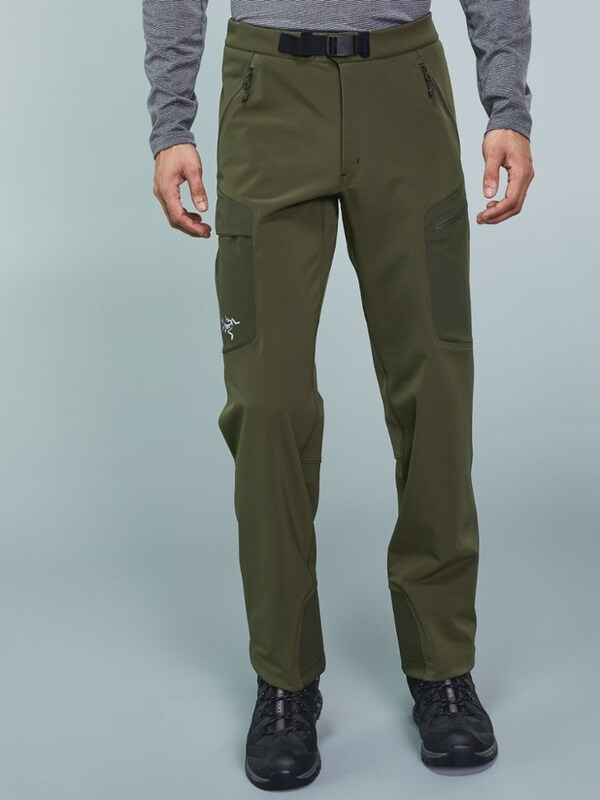 The Gamma SL Rock Pants are Arc'Teryx' beefed up version of the Gamma SL superlight soft shell material, which is a excellent hiking pant. The Rock Pant fixes some issues some may have had with the durability of the pants in a high wear situation like climbing and scrambling. The two are very similar except that the rock pant has reinforced the knees and rear, and added a really useful belt system that uses a daisy chain and metal clip, rather then stretchy nylon and plastic. The fit is quite tight compared to some soft shell trousers. 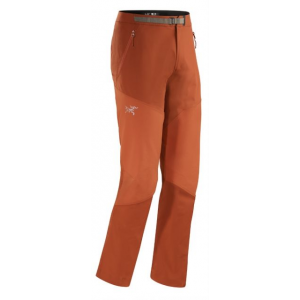 It is best described as snug, and even close to a tight fitting jean or chino. They are very stretchy and have articulated knees that bend effortlessly. The belt is really handy as it never comes undone. 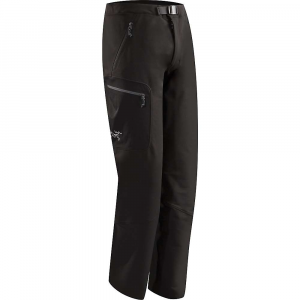 I took this pants to the Bugaboos and was really blown away with them. On the approach they managed well. As it drizzled on us the trouser shed any moisture. Scrambling they were brilliant. the range of motion and ability to move was great. The lack of baggy material meant no snags, or catching on jutting rocks. As it had snowed, and I didn't have my gaiters, the bootlace hooks at the front of the leg hem were brilliant. Multiple times they kept snow and scree from entering into my boot. Multipitch climbing they were brilliant, mostly because i didn't notice them. They were never loose, they never restricted my movement. I didn't feel the cold bight of the wind, or too hot either. The belt didn't come loose, and it didn't bunch up under my harness. As I rubbed them against the rock they showed no signs of wear. While a bit warmer and sweatier then the 5-Denier super thin pants I'm used to, on the hike up I was only a little bit sweatier than normal. Hiking up in the rain they felt great, and by the time I had stopped for 5 minutes I had dried off and was comfortably warm. But due to being a dark colour they got extremely warm in the sun. They weren't uncomfortable, but they definitely wouldn't be the best choice on a sweltering 30°C day. When the wind kicked up though they were amazing, blocking the gusts, and kept me from feeling the temperature change. Overall they are the best item I have bought in ages. Comfortable, and easy to move in they add to the climbing experience. They look great as well. Overall I'd say they are a classic Arc'Teryx piece that should be the staple of any alpine climber, shoulder-season climber, and scrambler. 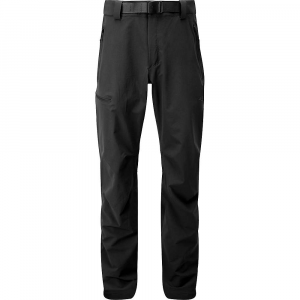 The Arc'teryx Men's Gamma Rock Pant is not available from the stores we monitor. It was last seen March 27, 2019	at Bentgate.com.